A couple comments on last week's iPod playlist post inspired me to write about how to get people to dance at your wedding. 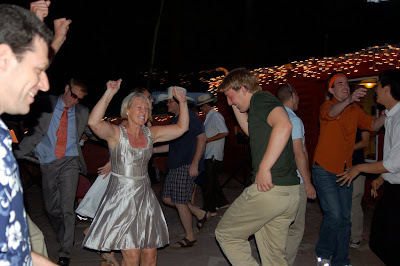 Our strategy was simple: we picked [what we considered to be] a very high energy first song ("Blister in the Sun") and we asked everyone in our wedding party (there were 12 of us all together) to please, please, please dance your hearts out to get the party started. To be even more strategic, we should have asked a few trusted friends and family members to commit to dancing right away, too. We didn't do this and everything still worked out well, but if I were doing it again, I might take out this little bit of extra insurance. I've found that friends are more than happy to help in whatever way they can. So much of the mainstream culture pressures us to turn our weddings into shows. They tell us that it's best for our guests to sit back, relax, and enjoy the performance. In my experience, I found that the guests who actively participated (in big ways like cooking the fajitas or small ways like being asked to clap during the ceremony) enjoyed the experience more because they helped bring the experience to fruition. We also had a help-yourself keg at our wedding, which really fueled the dance party (although I think alcohol-free festivities can be just as raucous). In addition to the dance party, we also had board games going on, hot-tub soaking, and story-telling around the campfire. Some family members congregated in the quieter areas to read the book my best friend made for us. The other question that came up within the comment section of that post was about how to get people to clap during the ceremony. I really, really wanted people to clap after each speaker in our wedding--not because it's a show but rather to show appreciation for the speakers, so I stealthily asked four friends in the audience and the wedding party to take the clapping/cheering lead. It worked well! Many people are itching to clap at a ceremony; they just need a catalyst to start the clapping. Please share any other ideas you all have! We're doing the "asking trusted friends and relatives to dance!" Figure it'll help us out a bit. We're also asking folks to suggest a song to play with their RSVPs so hopefully they'll get up and dance to their song! I think recruiting your own family and friends to get the party started, clap during the ceremony, etc. is a great idea. what a great blog! I love this post! My question, in the same vein, is this: In addition to dancing, how do you encourage guests to partake of the other activities you have set for them, like the board games, etc.? @ Jade: Sorry I didn't respond to your earlier question! I promise I read every comment. With a full-time job as a teacher, consulting, exercising, running the neighborhood time bank, and updating two blogs, I don't always get to respond the way I would like to! I'll try to make it up to you. I'll write a post addressing your question next week. Thanks for the idea! 1) Dancing-- a friend who got married a year before we did started telling people to "make sure to bring their dancing shoes" and otherwise emphasized that she wanted her reception to be about the dancing AGES before her wedding. By the time it came around, everyone knew that's what was important to the couple, and that's what they got. We did the same for our wedding, and asked our closest friends to at least help get the dancing started. Also, we put a fill-in-the-blank spot for folks to request a song for dancing on our RSVP postcards, and I passed these requests on to our DJ. When guests heard their song, they were excited and danced (ps-- I vetoed a number of these requests since they didn't fit the mood of our ceremony, and talked with the DJ about what kind of requests to accept on the day). A great DJ and/or songlist is imperative. I was at a wedding last year when the DJ played "Wind Beneath My Wings"-- nothing clears a dance floor faster than a sad/emotional song! 2) Clapping during the ceremony-- we actually put this in our ceremony script, so the judge who married us said, "This is a festive occasion and Autumn and David hope you will laugh out loud, clap, and joyfully participate in their ceremony." It worked-- people clapped after our musicians, readers, and when we kissed, and the whole mood was just light and super happy. Love the secret agents idea! I think we'll definitely ask some friends who will be more than willing to kick off the dance party! and I LOVE the clapping! We are definitely going to do that. Aww, thanks for your response Sara! How exciting, the prospect of an entire post dedicated to my question! BTW, I totally get that you are busy; take your time! These are great tips! Getting people to dance can be tricky - I tried, but crashed and burned. At some point I had heard that if you want people to dance at your wedding, YOU have to be dancing. I've found this to be COMPLETELY true...looking back at friends' weddings, a lot of times people weren't dancing, but neither was the bride or groom. At our wedding, if I was out dancing, so was everyone else. As soon as I left the floor (even if I was nearby) everyone else disappeared too. It didn't matter so much if my husband was out there or not...it was all about the girl in the white dress. We weren't interested in prolonging the first dance, and we didn't have any other planned dances (like the father/daughter dance), so we asked a bunch of family members and friends to wait a minute or so into the first dance, then join us on the floor. Because our wedding was so darned DIY, this also made sure that everybody stopped fussing and fixing things and started enjoying the party. It worked beautifully: when they saw other couples (or trios, or parents-and-kids) join us, the whole crowd understood that the dance floor was open. There's a great photo of the whole hall full of friends and family dancing. About 20% of our crowd was kids, and I tried to dance with all of them. Kids usually love to dance, especially at a big party, and they really loosen up a crowd!